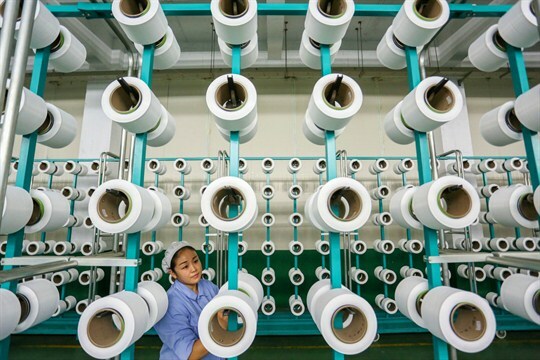 A woman works in a weaving factory in Jinjiang, in southeast China’s Fujian province, Nov. 22, 2018 (Chinatopix photo via AP Images). The World Trade Organization now has more than 160 members, ranging from the United States to tiny Burundi, the poorest country in the world, according to the World Bank. Afghanistan and Liberia are the WTO’s newest members, joining in 2016, and they are similarly poor and underdeveloped. Under WTO rules, developing countries receive “special and differential treatment” in recognition of their higher levels of poverty and lower levels of capacity to implement certain trade obligations. Yet the WTO has no objective criteria that define the difference between “developed” and “developing” member states. Rather, countries can “self-declare” as a developing country, no matter how big or how rich.